Download "We are happy to discuss your concerns and are always ready to listen to your comments and views on the care we provide." 1 Complaints, concerns and compliments We are sorry you have a complaint. 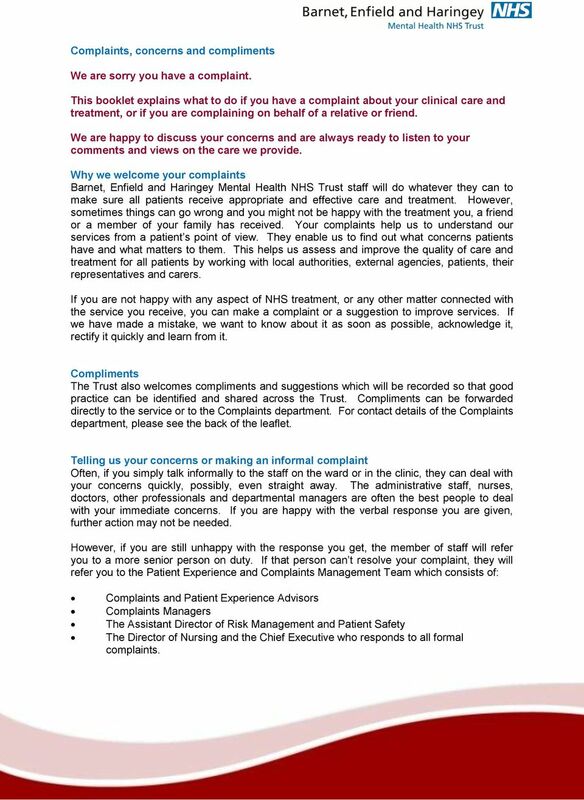 This booklet explains what to do if you have a complaint about your clinical care and treatment, or if you are complaining on behalf of a relative or friend. We are happy to discuss your concerns and are always ready to listen to your comments and views on the care we provide. 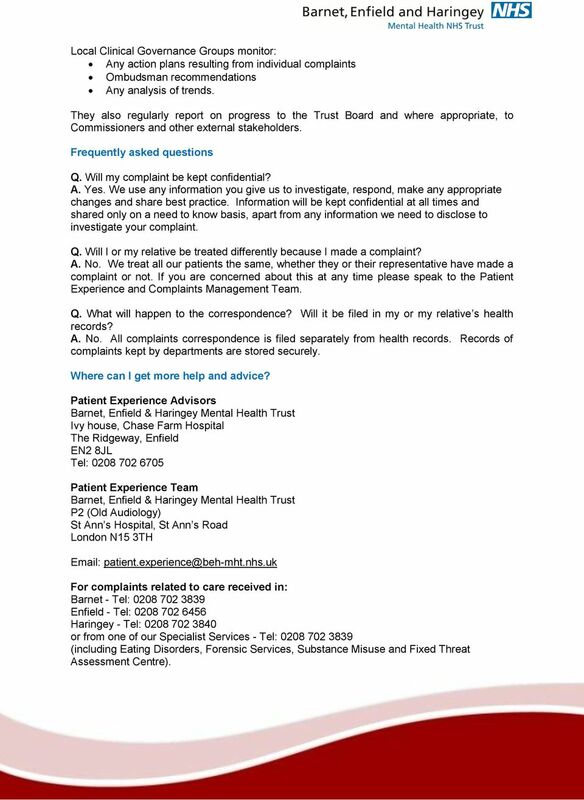 Why we welcome your complaints Barnet, Enfield and Haringey Mental Health NHS Trust staff will do whatever they can to make sure all patients receive appropriate and effective care and treatment. However, sometimes things can go wrong and you might not be happy with the treatment you, a friend or a member of your family has received. Your complaints help us to understand our services from a patient s point of view. They enable us to find out what concerns patients have and what matters to them. This helps us assess and improve the quality of care and treatment for all patients by working with local authorities, external agencies, patients, their representatives and carers. If you are not happy with any aspect of NHS treatment, or any other matter connected with the service you receive, you can make a complaint or a suggestion to improve services. If we have made a mistake, we want to know about it as soon as possible, acknowledge it, rectify it quickly and learn from it. Compliments The Trust also welcomes compliments and suggestions which will be recorded so that good practice can be identified and shared across the Trust. Compliments can be forwarded directly to the service or to the Complaints department. For contact details of the Complaints department, please see the back of the leaflet. Telling us your concerns or making an informal complaint Often, if you simply talk informally to the staff on the ward or in the clinic, they can deal with your concerns quickly, possibly, even straight away. The administrative staff, nurses, doctors, other professionals and departmental managers are often the best people to deal with your immediate concerns. If you are happy with the verbal response you are given, further action may not be needed. However, if you are still unhappy with the response you get, the member of staff will refer you to a more senior person on duty. If that person can t resolve your complaint, they will refer you to the Patient Experience and Complaints Management Team which consists of: Complaints and Patient Experience Advisors Complaints Managers The Assistant Director of Risk Management and Patient Safety The Director of Nursing and the Chief Executive who responds to all formal complaints. 2 What is the Patient Experience and Complaints Management Team? The Patient Experience and Complaints Management Team can provide on the spot help to resolve concerns quickly and efficiently by giving support or by liaising with Trust staff and managers. The team also holds regular Talk Me Through It sessions, where you can raise your concerns with the team. To find out when and where the next session is taking place please contact the Patient Experience Advisors or Complaints Managers. If we are unable to resolve your concerns informally, the team can advise you on how to make a formal complaint. What is the time limit for making a formal complaint? If you are unhappy with any aspect of the service you have received, you should complain as soon as possible. Complaints should normally be made within 12 months of the date of the event that you're complaining about, or as soon as the matter first comes to your attention. However, the time limit can sometimes be extended where it would have been difficult for you to complain earlier and where it is still possible for us to carry out an effective investigation. Making a formal complaint If you wish to make a formal complaint you should write to or telephone the respective Complaints Managers for the service you are complaining about. Alternatively you may write to the Chief Executive. The Complaints Manager will acknowledge your complaint in writing within three working days of receiving it. Before you make a complaint, it is important to think about what you would like to happen as a result of your complaint. You may want: An apology Someone to explain what has happened Some changes or improvements to be made To make sure people recognise their mistakes To make sure the same thing does not happen again. Raising a formal complaint verbally If you prefer, you can discuss your complaint with the Complaints Manager by telephone or in person. If you do so, you will receive a written record of your verbal complaint which you will be asked to check to ensure it is accurate. 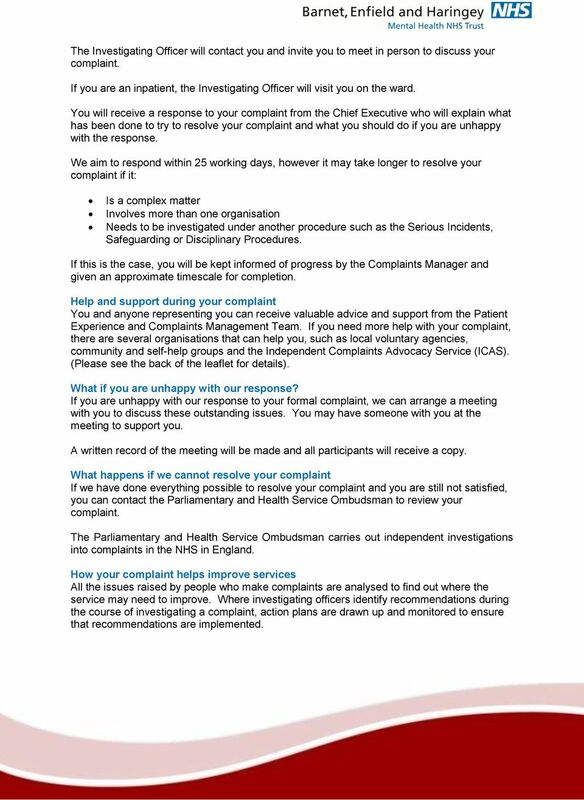 If your complaint is about a member of staff you will be asked to sign the statement. If you are complaining on behalf of a patient and the complaint is about the Trust s treatment and care of that person, we will need their consent for us to disclose any personal information to you. We will also ask you how you wish to be addressed, for example, either as Mr, Mrs, Ms, Miss or by your first name. 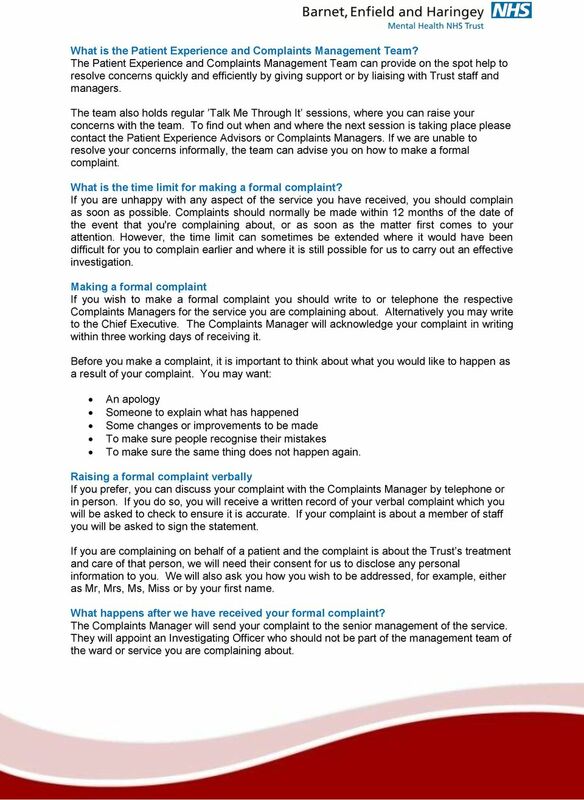 What happens after we have received your formal complaint? The Complaints Manager will send your complaint to the senior management of the service. They will appoint an Investigating Officer who should not be part of the management team of the ward or service you are complaining about. 3 The Investigating Officer will contact you and invite you to meet in person to discuss your complaint. If you are an inpatient, the Investigating Officer will visit you on the ward. You will receive a response to your complaint from the Chief Executive who will explain what has been done to try to resolve your complaint and what you should do if you are unhappy with the response. We aim to respond within 25 working days, however it may take longer to resolve your complaint if it: Is a complex matter Involves more than one organisation Needs to be investigated under another procedure such as the Serious Incidents, Safeguarding or Disciplinary Procedures. If this is the case, you will be kept informed of progress by the Complaints Manager and given an approximate timescale for completion. Help and support during your complaint You and anyone representing you can receive valuable advice and support from the Patient Experience and Complaints Management Team. 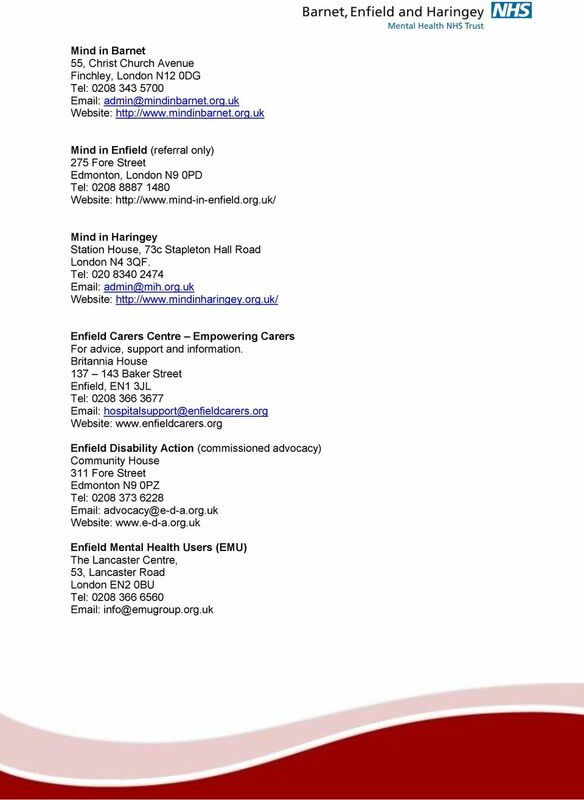 If you need more help with your complaint, there are several organisations that can help you, such as local voluntary agencies, community and self-help groups and the Independent Complaints Advocacy Service (ICAS). (Please see the back of the leaflet for details). What if you are unhappy with our response? If you are unhappy with our response to your formal complaint, we can arrange a meeting with you to discuss these outstanding issues. You may have someone with you at the meeting to support you. A written record of the meeting will be made and all participants will receive a copy. What happens if we cannot resolve your complaint If we have done everything possible to resolve your complaint and you are still not satisfied, you can contact the Parliamentary and Health Service Ombudsman to review your complaint. The Parliamentary and Health Service Ombudsman carries out independent investigations into complaints in the NHS in England. How your complaint helps improve services All the issues raised by people who make complaints are analysed to find out where the service may need to improve. Where investigating officers identify recommendations during the course of investigating a complaint, action plans are drawn up and monitored to ensure that recommendations are implemented. 4 Local Clinical Governance Groups monitor: Any action plans resulting from individual complaints Ombudsman recommendations Any analysis of trends. They also regularly report on progress to the Trust Board and where appropriate, to Commissioners and other external stakeholders. Frequently asked questions Q. Will my complaint be kept confidential? A. Yes. We use any information you give us to investigate, respond, make any appropriate changes and share best practice. Information will be kept confidential at all times and shared only on a need to know basis, apart from any information we need to disclose to investigate your complaint. Q. Will I or my relative be treated differently because I made a complaint? A. No. We treat all our patients the same, whether they or their representative have made a complaint or not. If you are concerned about this at any time please speak to the Patient Experience and Complaints Management Team. Q. What will happen to the correspondence? Will it be filed in my or my relative s health records? A. No. All complaints correspondence is filed separately from health records. Records of complaints kept by departments are stored securely. Where can I get more help and advice? Patient Experience Advisors Barnet, Enfield & Haringey Mental Health Trust Ivy house, Chase Farm Hospital The Ridgeway, Enfield EN2 8JL Tel: Patient Experience Team Barnet, Enfield & Haringey Mental Health Trust P2 (Old Audiology) St Ann s Hospital, St Ann s Road London N15 3TH For complaints related to care received in: Barnet - Tel: Enfield - Tel: Haringey - Tel: or from one of our Specialist Services - Tel: (including Eating Disorders, Forensic Services, Substance Misuse and Fixed Threat Assessment Centre). 6 Independent Complaints Advocacy Service (ICAS) Main Office: POhWER Freepost, P.O. Box Birmingham B6 9BL Tel: The Parliamentary and health Service Ombudsman (PHSO) Millbank Tower, Millbank, London SW1P 4QP Tel: Monday to Friday between 8.30 am 5.30 pm. 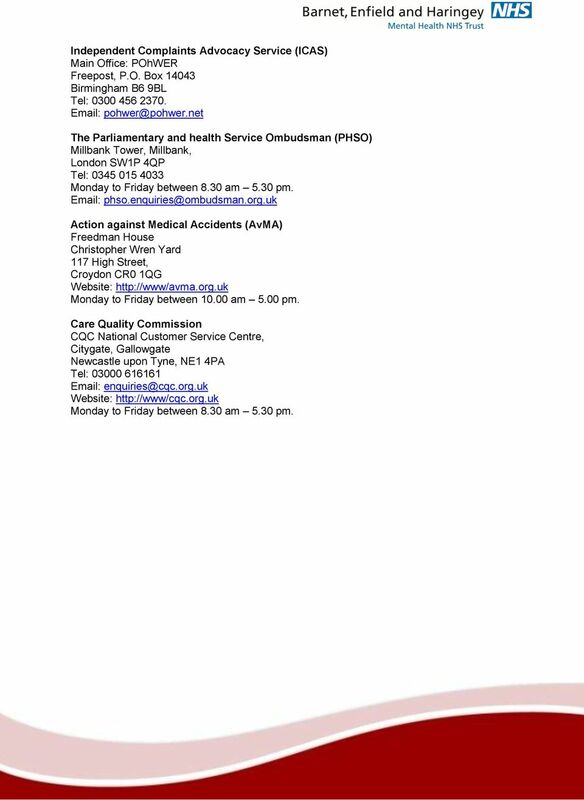 Action against Medical Accidents (AvMA) Freedman House Christopher Wren Yard 117 High Street, Croydon CR0 1QG Website: Monday to Friday between am 5.00 pm. Care Quality Commission CQC National Customer Service Centre, Citygate, Gallowgate Newcastle upon Tyne, NE1 4PA Tel: Website: Monday to Friday between 8.30 am 5.30 pm.